Pixel Tileset: Temple / Dungeon is a Free Retro 4-color style tileset for making simple dungeon crawler style environments. 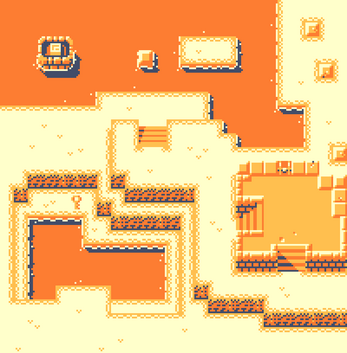 Included are 5 color swapped versions of the tileset. All are on a 8x8 pixel grid. And Include animated elements such as water tiles, an opening chest, spinning key, flickering wall torch, wall switch and button, and a strange rising treasure box. Hey! Thanks to everyone who has downloaded &/or purchased the tileset! Credit for anything made with these pieces isn't necessary, but I would love to see what people have made with these pieces, so comment with a link to your work, or tag me on social media (@colinbrown_ Twitter&Insta) so I can find you. That would be awesome. This project will have free updates. Also, more Tilesets to come. This tileset is beautiful and you made it in a way which allows me to easily use shaders to swap palette easily at runtime, thank you for the gray one!